Is your school PTA considering a mobile and online school directory for your school parents? How will you select from the number of vendors that are available? What will be your criteria? Trust: It can be a daunting task to select from a large number of available school directory vendors. The key driving force should be to find a trusted product by a trusted vendor. Word of mouth is always a good start in the selection process. But, Google search can also provide you with a list of directory providers. Choose a provider that has been doing business for several years minimum and has built up solid product repertoire and an online presence. Assess the founder and the team behind the product. LinkedIn is an excellent platform to find additional information about their professional background and expertise. The websites for each of the vendors will also provide you with information on the product as well as user feedback. While the reviews presented on the website are selected by the vendor, a better place for unbiased reviews are the App Store and Google Play where users leave their comments on the product. A ‘surefire’ way of assessing the product and the vendor is for you to ‘test drive’ a sample directory and also talk to the vendor about the requirements for your parent organization that can extend beyond the directory, such as group communication with your membership and eCommerce for fundraising. As you ‘test drive’ both the ‘user side’ as well as the Administrative side of the directory to make sure that its usage is intuitive to you. While you are in discussion with the vendor, inquire about data upload for compiling your directory. An optimal solution is to obtain permission from your school principal or school district to access a student/parent data. With permission granted, your vendor should have the capability to upload this data to the directory. However, if your school or district cannot provide you the student/parent data due to privacy concerns, then, the vendor will also need to provide you with a format for parents to directly provide this information and consent to be in the school directory. Security: A primary concern is the issue of information privacy. You want to find a ‘trusted’ vendor who is known for their expertise in database security. Google search will generally yield information about their credentials and their product. You also want to make sure that the software agreement that you sign with the vendor clearly spells out the vendor’s responsibility in maintaining data security and privacy. Value: How will your parent organization pay for this directory software is also a major factor in the decision. Price range will vary between vendors depending several factors, including the amount of work required from the parent organization to create the directory, the available features, e.g., eCommerce for fundraising, group email for membership communication, product utility & appeal and the support the vendor is willing to provide you and your parent membership. Better quality of these variables will ensure that you will be purchaing an optimal product for yor school. Support: Change is not easy and you want as much support as possible when you start out. You don’t want to wait for 24 hrs or longer before your call can be answered. You also do not want to communicate through endless rounds of email only. You want someone who can help you or your parents when you want that help. To walk you through and guide you as you make that transition. If immediate support for the directory software is not available, then, the transition to the digital directory can be very rough. Change to a digital directory can also have a major impact on the parents, the parent organization and the school community. 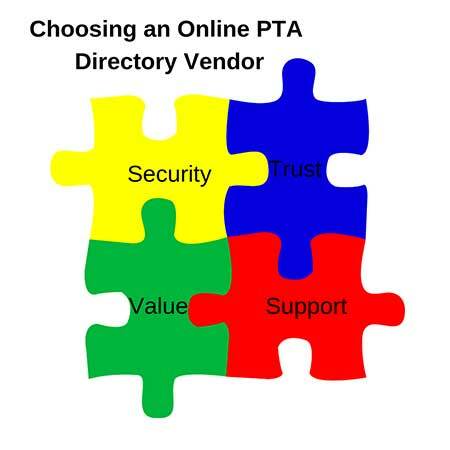 Choosing the right directory that fits your needs will help you and the school parents immeasurably as attested by a PTA leader on the National PTA Blog. “The transition to an electronic directory move was a big step for our parent PTA members, but …. they (parents) can’t imagine going back!” “the once overwhelming position of PTA directory chair became a very simple, almost non-existent job.” Read more. To get an overview of the software available for PTAs, then please read the ‘Complete PTA software guide‘.